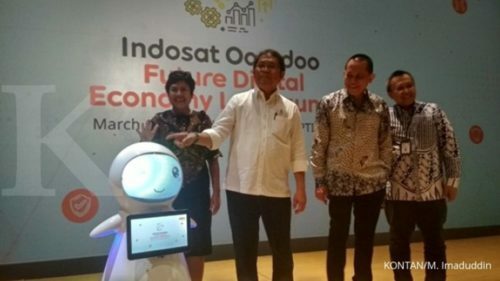 Preparing young people to meet the 4.0 industrial revolution, PT Indosat Tbk or Indosat Ooredoo officially introduced the Future Digital Economy Lab. The first laboratory completed was at the Bandung Institute of Technology. The launch of the digital economic laboratory was held in two places, namely at the Indosat Ooredoo Head Office, Central Jakarta and the ITB Ganesha Campus Bandung, Monday (18/3) morning. Through the Indosat Ooredoo Business line, it strives to create business opportunities in various industrial sectors by providing a platform for developing innovation, strengthening resources, and producing various use cases based onInternet of Things (IoT) that can be created in their own country. Said PT Indosat Tbk President Director Chris Kanter, this is Indosat Ooredoo's first step in developing digital futures for Indonesia. "We are indeed the main focus of development in digital entrepreneurship. We want the creations created by our nation's children to be shared so that we get the best for this nation," Chris said in his remarks. Minister of Industry Airlangga Hartanto, Minister of Communication and Information Rudiantara, and ITB Chancellor Kadarsah Suryadi who were present at the event expressed their appreciation for the efforts of issuers coded ISAT shares, members of the Kompas100 index, to accommodate the nation's young talents.